Welcome back to this blog. This month, I will be looking at the remaining points I left out from the first part of the post “REALITY IS A COMPLEX OBJECT”. In the first part, I explained the reasons behind the denial of complexity. I also talked about Plato’s allegory and his view on the human observation process of Reality. Then, I proceeded to introduce a series of reasons why Plato could be right, when he stated that the human observation of Reality is incomplete. The first reason was the existence of a possible dimensional mismatch between the real object to be measured and the measuring tool. The second point was, through the eyes of the modern Physics, how Reality shows up right before our eyes in dramatically different ways, depending on the context. Therefore, a first conclusion to be drawn is that the dimensional mismatch and the multi-faced Reality are aspects that we should take into consideration when dealing with real problems. The second part of this post is devoted to complete my reasons to support the view of a complex Reality. The two remaining reasons to be explained are what I call the “non-observable” and “non-predictable” universes. Finally, I will devote a section to explain what I mean with this post, and how we can use these ideas as a framework for a new perspective to confront problems in life. I refer here to that portion of Reality that is beyond our direct observation as the “non-observable Universe”. We have this situation when this portion of Reality is in a plane that we cannot reach. Keep calm, I did not go crazy (yet), I am not talking about esoteric or religious planes, but about real planes that simply are not reachable by a direct observation. An object can be non-observable due to either its intrinsic nature or the impossibility to obtain all the necessary information that defines the object, even if this information is in an apparently reachable plane. Let’s set forth both cases with a couple of examples. WARNING: No animals have been mistreated in the writing of this section. Erwin Schrödringer was an Austrian physicist regarded as one of the fathers of the Quantum mechanics. He came up with a thought experiment to let general people understand how things work in the sub-atomic world, in a more understandable way. The experiment consists in a cat shut up in a sealed box. Into the box, there is a device with a phial, filled with poison. The device also consists in a unique radioactive particle with an associated probability of 50% to get disintegrated, over certain period of time. If the particle gets disintegrated, the device will cause the break of the phial and hence the death of the cat. Therefore, after a given period of time, the cat will have a chance of survival of 50%. The experimenter has no way to know what happens into the box until he/she opens it up. So, for the experimenter, if the cat were a quantum object, the cat would be in a superposition of alive/dead states with even probabilities (50%/50%). This superposition of states would last until an observation takes place. Therefore, when the experimenter opens the box, the quantum cat collapses (in the same way as the particle I talked about in the first part of this post) into a state, alive or dead. 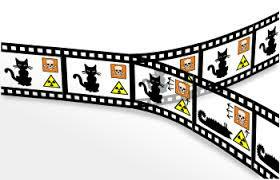 Now, you can see the following one-minute video illustrating the Shcrödinger’s cat experiment. Of course, we should not take this thought experiment too serious, since it is not more than an analogy to understand what it happens in the quantum world. We know at this stage, if you read the first part of the post, that in the macroscopic world the quantum laws do not apply. However, this analogy is useful to show what I mean when I talk about the non-observable world. In the quantum domain, the plane of the superposition of states is non-observable, since it collapses each time we try to take a look into it. So, let’s say that things evolve in a non-reachable plane. When the observer takes a look at a quantum object, the former only gets a result, an option, coming from the real state of the object. So, the experimenter gets only a small piece of information. 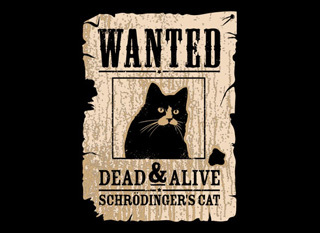 If he/she finds a cat dead, he/she will know that that “dead state” was one possible state, with an associated probability different from zero, in the evolution of the cat’s wave function. However, the amount of possible states and the probability distribution among them remains unknown for the experimenter. Figure 7. Schrödinger’s cat. Superposition of states and the measurement process. Figure 8. Somewhere in the quantum far west. I should mention here, that the explanation of a parallel plane in which several realities are overlapping corresponds to the so-called “Copenhagen interpretation” of the Quantum mechanics, which is the most accepted. However, there are other interpretations of the reality of the quantum processes. One of them, called the “many worlds” interpretation, introduces the existence of multiple universes allocating the different realities overlapping in the wave function. So, according to this interpretation, there would be a universe, with an alive cat, and another parallel universe with the same cat dead. So, an observation would have the effect of producing a bifurcation of the observer into one of those parallel universes. According to this view, a person observing quantum processes would be moving through different universes. The answer to which interpretation is the correct one remains unsolved nowadays. Figure 9. The “many worlds” interpretation. The same cat, in different states in parallel universes. In any case, whatever the real interpretation is, either a parallel plane with a superposition of realities or a set of real parallel universes, the point is that the observer cannot observe the whole quantum object as it is, but only one of its possible manifestations. So, we can say here that the overall reality of this type of objects is set in a non-observable plane, and that is due to the intrinsic nature of the object, not due an imperfection in the measurement process. There is another non-observable universe in a parallel plane, but this time it has no relation with quantum mechanics. This non-reachable plane can be found at a macroscopic level, the level we all are in contact with. Now, the reason why this plane is not reachable is not due to its intrinsic nature, but due to the impossibility to gather all the information necessary to define the object we are trying to get an insight into. Certain objects or systems have the information that defines them, spread within a big portion of the observable universe. This spread of information leads to an impossibility for the object to be defined completely, since the observer would need to have all the information contained in a large portion of the observable universe. This is the case of any type of risk, like for example the financial and terrorist risks. The influence of thousands, or millions of variables evolving with time, shapes a dark shadow which is the real probability of something to happen. I distinguish the perceived risk from the real one. I always found interesting how some people are afraid of skiing, for example, but drive their cars as fast as possible. I will not be going into why people consider an activity less dangerous than others, only because they feel a higher level of control, even if that feeling is totally subjective. We often build simple models of risk, based on what we read on the newspapers or on what someone told us about how dangerous is, for example to visit Johannesburg. We assess the risk, but the real underlying shadow is not necessarily mapped in a correct way with our models. What is more, I am afraid our simple models are too simplistic as to describe correctly the real risk affecting our life. If we move to a more complex type of models, like the ones developed by the security agencies, trying to model crime or terrorist menaces, we can understand quite easily how difficult is to create a real map of the dark shadow. In the case of terrorism, someone willing to build a map of the real risk, should access almost all the information sources present in the country they try to protect, or even beyond, since nowadays we are under the influence of global menaces, and the events happening far away may have a significant influence. Within these sources, we should include not only the digital communications among the citizens, but also their verbal communications and even their thoughts. The recent and sadly famous events carried out by lone wolves make the task of measuring the risk impossible. Figure 11. Hierarchical terrorist network. Information well defined. 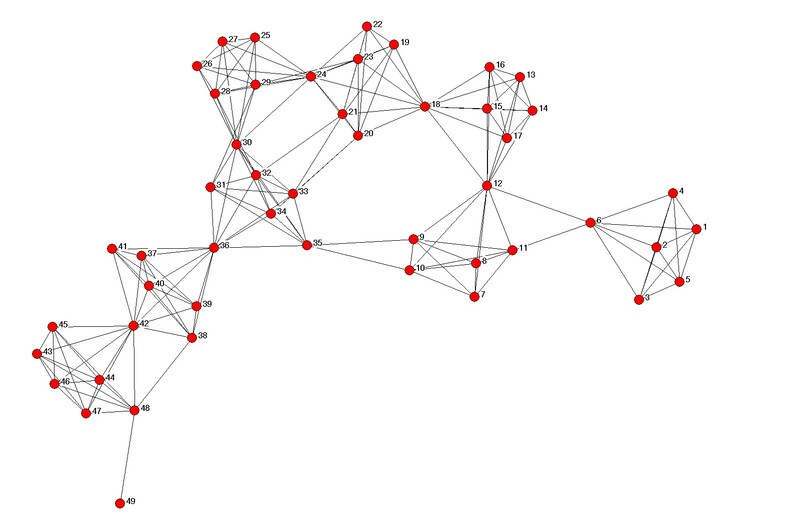 The evolution from terrorist hierarchical networks to disconnected cells and later on to lone wolves, has the effect of spreading the information a security agency needs to access to in a larger portion of the observable world. Hence, building a map of the dark shadow has turned out far more difficult. Figures 11 to 13 illustrate this effect. Figure 12. Structure of slightly connected cells. Distribution of information. Figure 13. 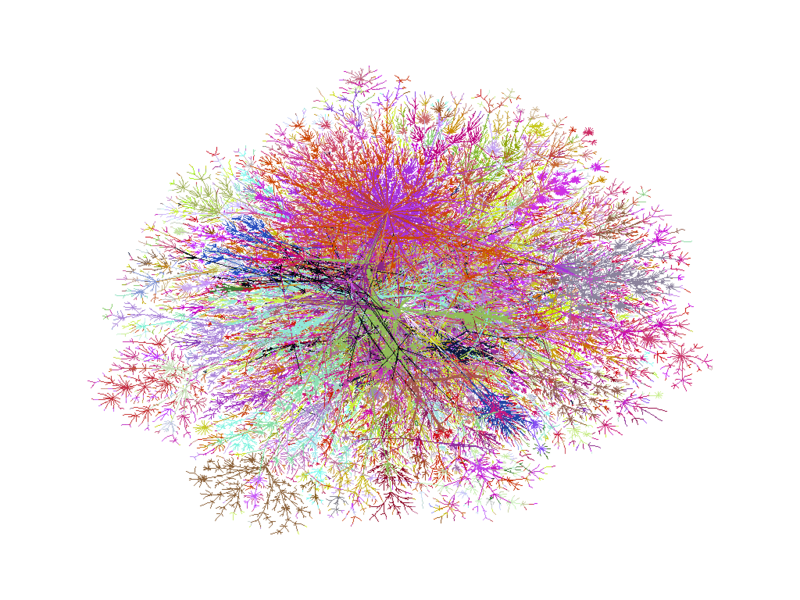 Information spread within a fuzzy network. We can conclude with this example, that there is a non-observable universe not related with an intrinsic strange nature preventing us from access, but related to the spread of the significant information in a huge amount of elements. The non-predictable universe consists in a series of special objects whose future evolution cannot be predicted, even when we have all the information that defines the object and its state. So, now it is not a matter of lack of information, like for the objects belonging to the non-observable universe. How is it possible that having all the information related to a system we cannot predict its evolution?. There are at least two types of systems that, for different reasons, fall into this category. Next, I proceed to talk about each one. 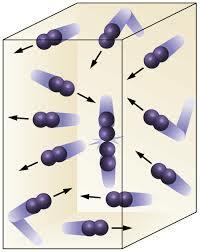 A typical example is a gas consisting in millions of molecules, ruled by deterministic laws (one action one reaction). Statistical mechanics is the branch of the physics that studies these systems. I must say here, that we can use either a classical statistical mechanics (without taking into consideration quantum effects in the molecules) or an improved approach taking the mentioned quantum effects into consideration. Let’s focus on the classical statistical mechanics to show how a pure deterministic system (each single molecule can be considered like a compact ball ruled by Newton mechanics) is non-predictable when it is formed with millions of elements. In this framework, we have that each single interaction is deterministic (cause-effect relation, no random behaviour). Hence, we can predict the evolution of each gas molecule based on its current state (position and speed), but we find a problem when it comes to predict the evolution of a volume of gas with millions of particles. It is mainly a computational problem, since calculating the Newton equations for each molecule and adding then the effects over the whole volume of gas is unapproachable. That is the reason why these systems need to be managed in a statistical way, assuming that the consisting elements behave randomly instead of being ruled by deterministic laws. In summary, we have here an overdose, instead of a lack, of information, what leads us to face the problem like if it were formed with random elements. When using statistical mechanics, the collateral effect is that we can only predict mean values for the macroscopic variables. It means, for example, that we can predict the mean temperature of the gas, but it does not imply that all the molecules in the gas are at the same temperature. Instead, there will be a big range of temperatures whose mean value is the one that the statistical mechanics predicts. Figure 14. Even if each molecule is ruled by deterministic laws the evolution of the overall gas cannot be predicted deterministically. Statistical mechanics needs to be used. Chaotic objects are not predictable, even when we have all the needed information to define them. The underlying cause of this phenomenon is the so-called “sensitivity to the initial conditions”. Chaotic systems are deterministic, however they have a really interesting property: if we vary slightly the value of the input by a really small factor , let’s say 0,000000000000000000000000000000000000000000000000001, then the value of the chain of outputs behaves in ways dramatically different. Therefore, for two quite close initial conditions ( and ) we will have output chains diverging dramatically with time. This divergence is measured by the Lyapunov exponent of the system. Do not get scared, I will not be explaining what Lyapunov exponent is, I do not want you to quit this post at this stage. It is only important that you understand the physical meaning of that exponent. When it is positive (greater than zero), two close values of the input will lead the output chains to diverge with time. The greater the positive value of the exponent the greater the divergence. However, if the exponent is negative (less than zero), then slight differences between two inputs will lead to output chains converging to the same value in a short period of time. In this latter case the system is not chaotic, but a normal system, like the ones we studied at the high school. The value of the Lyapunov exponent can also be zero, causing two different inputs lead to two output chains evolving in a parallel way with a small difference between them. Figure 15. Two initial conditions in a chaotic system start their evolution quite close. Their evolution diverge quite fast with time. A question now, do chaos systems have something to do with us?, are they present in our daily life?. I will answer with another question: have you ever wondered why if we have been increasing incredibly fast the computational capabilities of the computers, we have hardly improved our capability to forecast the weather?. The reason is that the equations ruling the atmospheric phenomena are chaotic. So, if we set the input variables (temperature, pressure, etc.) of the weather equations with values slightly different from the real ones, then we will have that the chain of predicted output values initially will be close to the real chain, but getting degraded very fast with time. For sure you will be wondering what I wondered for a long time when I started reading on chaos theory. Why are meteorologists inserting wrong values for the temperature, pressure and other variables into the equations?, are they stupid?. The answer to that is something that is not easy to find in webs and books on chaos theory. The reason is that we do not have perfect measurement tools, and we will never have. So, when measuring the temperature at certain height in the atmosphere, our tools will have a small error (in the twentieth, or thirtieth decimal place). That incredibly small error will make the prediction (chain of outputs) diverge very quickly from the real weather evolution. In summary, we cannot predict the behaviour of chaotic systems beyond certain prediction horizon, which will depend on the Lyapunov exponent for each system. The first person to realize that weather prediction in the long term may be a problem with no solution, was Edward Lorenz in 1963 (2). 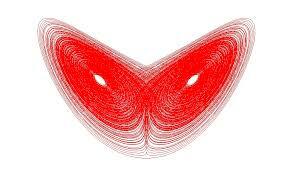 He found out that behind his weather model there was a butterfly-shaped strange attractor. I will not explain what a strange attractor is, I will probably do in a future post, devoted entirely to chaos theory. Meanwhile you can enjoy the beautiful shape showing up when depicting the solutions of the Lorenz equations. Time to draw conclusions. Let’s summarize, we prefer to accept a simple model of Reality because it is easier. We are afraid of uncertainty and besides that, we are lazy. A simple model of Reality is less scaring and more comfortable. It is perfect, except for the fact that trying to avoid the feeling of uncertainty we blindfold and throw ourselves into the depth of uncertainty by not adopting sensible strategies to face a complex world. It is a sort of paradox, by denying our enemy we throw right away in his arms. We cannot defeat an enemy without looking right in his eye. What can we learn from the mentioned “dimensional mismatch”, “multi-faced reality”, “non-observable” and “non-predictable” universes?. We can learn that the context determines the way we should look at things. Each context has its own strategy, its own pair of glasses to see the reality such as it is, in the same way as each mood determines the cloth colour to be worn. There are no strategies to face problems, there are set of strategies, or tools, to be applied based on the varying context. Nobody said that this would be easy. This is an invite to join me in the search for a set of tools to get a wider view of Reality. The trip will provide us with a wider view of Reality, and hopefully an improvement of our skills to be more successful when facing varying practical situations. Shall you dare to join me?. If so, see you next month.